Ah yes, another Jamaica trip! Yah man -- no problem. We had been to this resort four years ago, but that was before the Beaches and Sandals resorts had merged. A lot has changed in four years! 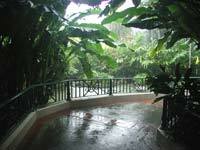 The old Beaches resort is now called The Manor, and the old Sandals resort is now called The Riveria. These are two very different parts of the same resort. For our previous visit we had stayed in a villa up on the hill (The Manor). This time we stayed in an ocean front room in The Riveria. The biggest change since our last visit is that huge manor lawn and tennis courts have been replaced by a beautiful new pool. This is really something that the resort had needed! Unfortunately, this pool is very far from the beach area. Travelling between the two is a litte bit of a hike (or you can take the shuttle). Most people pick one location or the other and stay there all day. We generally stayed at the beach, but made occasional trips up the hill to use the rock wall. The weather was not really what we had hoped for -- it rained four and a half days out of the ten days we were there. This was a major obstacle for all of the outdoor things that we like to do while on vacation. We could still hit the swim-up bar and the hot tub in the rain, but our drinks got watery pretty quickly! We made the best of it, and chronicled some of the trip highlights in the photos below. Spirit Air started our trip off on a really bad note. Our plane needed repairs. We should have arrived at 1:30, but we arrived at 9:30 -- with no luggage. After a quick shopping trip at the hotel store, we were ready to hit the beach. Do you like Hali's new swim suit? This is the view from our first room; which we changed because it was in a loud location. Okay, we don't have luggage, but we're still catching rays in the sun! The view from our second room. They were very accomidating about changing our room. Our luggage showed up around noon. The grounds on the old Sandal's side of the resort were new territory for us, and we found them to be very nice. A night time shot near the new manor pool. Another shot near the pool. A nice shot looking down from our room at night. There are several, well maintained ponds. This one has several levels that cascade down beautifully. This was the most beautiful morning of our trip. The water looked crystal clear. We were about to go horseback riding, but we told ourselves that we would go snorkeling tomorrow morning. Little did we know what surprises mother nature had in store for us (insert evil laughter here). Several statues were located amongst the gardens. A nice touch. Here we are mounted upon our trusty steads: "April" and "Patience". We did the jungle tour with Hooves, and they always do a great job. Our friendly and knowledgable guides, Omar and Londo. We rode from the mountain ridge down into the jungle. Here we passed two men collecting fruits to sell in the market. We stopped at a wonderful little swimming hole surrounded by nothing but rainforest jungle. We returned to the resort just as the rain was starting, so we whiled away the afternoon hours taking pictures and checking out the hot tubs. We think this very friendly young woman is one of the managers (or perhaps "the" manager). She remembered us from our trip four years ago, but we don't remember her name (sorry!). One of many very creative wood carvings found all over the resort. Hali with two friends from Canada -- Leia (sp?) and Patrick. They were bummed because the weather cancelled their dive. There's supposed to be an "aviary", but all we could find was this one imprisoned jail bird. The old beach pool is still sporting some neat mosaic tiles. This pool has a swim-up bar, but the cool temperature limited the in-water attendance. This is the returning guests dinner -- which was very nice. We sat with some nice people that we met in the hot tub. This is a shot of us hanging around in the Manor lobby. Many a game of Jenga was played here! Leia and Hali as we were waiting to be seated in the Asian restaurant (Orchids). This was our favorite restaurant. Did we mentioned that it rained? A lot? The rain caused us to take drastic action -- we used the gym (several times). This is Hali Apre-gym on the balcony of our room. The room was nice enough, if a little dated. After a day or two of heavy rain, you could easily see the light brown water being pulled out from the nearby river. Hopefully this was mostly sand runoff! Oh, and it rained. And rained. We didn't try the slots, but pool tables were often available. Finally -- the sun came back out! Hali soaking it up on the pier. Hobie sailing was the number one draw this trip. There were days when the wind surfing would have been great, but water sports was closed on those days (bummer). The water looks pretty calm here, but most days had 6-8 ft rollers beyond the reef. Lot's of fun! Several of the ponds (like this one) were home to many large fish. There were several species beyond the typically goldfish, and they seemed very well cared for. Hali sitting down to enjoy dinner at Orchids. The food at all of the restaurants was very good! Some local artwork on display. I didn't notice the grasshopper when I took the photo. Can you find it? Hali flying up the rock wall. The rules were a bit more restrictive this time around. Reservations required. If Andre is working, he'll set a rope on the hard route for you (Latoya probably won't). Hali basking in the rays at the awesome Manor pool. Me and Hali at Valentino's (snapped by a real nice guy we met down there with his family -- a fellow Nikon fan). This is the pier after they put up a bunch of xmas lights. Very pretty. This awesome Sandal's staffer is Michelle. Our first night there (when we were very late and very tired), she walked us to our room and then to a nearby restaurant that was still serving dinner. Thanks Michelle! Rooms: 8.5 The rooms were a little aged, but there was a CD palyer and the bed was decent. The bathrooms have a single sink, and a tub/shower unit -- nothing fancy, but very adequate. Our first room was right above the open lobby, but they moved us to a more quiet location the next night. Very minor A/C issues were quickly resolved. Water sports/Activities: 8 Rain limited many activities. The Hobies were in pretty good shape. Easy sign up. No time limit. Good availability. Windsurfing equipment was shabby for any advanced sailing, and they close water sports down when the wind picks up too much (ie, enough to have fun). The beach volleyball area is now in a little used part of the beach, and rains stripped away the thin layer of sand that had been above the cement. The two gyms were in nice shape. The rock wall was fun, but the limited access was a bit of a drag (as was mean Latoya). Bars: 9 Real bananas in the drinks, and very good bartenders. They were a little shy of the top shelf booze that we favor. Baileys could be found on rare occasion, but no Grand Marnier and no Ameretto di Saronno. No shortage of good rum, though. Restaurants: 9.5 Food quality and service were both very good to excellent. We always did the buffet breakfast and lunch, and then an ala carte restaurant for dinner. However, ala carte breakfast was also available, as was a buffet dinner. We tried all of the restaurants except for the grill, and all were very nice. No reservations required -- also very nice. Grounds: 9 The resort is very spread out, which can be nice when it's not pouring rain. The combined resort still feels like two different resorts, but I suppose that it's just more to explore! The beach areas could use a little remodeling/redesigning. It's nice to have a few pools and hot tubs throughout the grounds. The ponds are a nice touch, also. Overall Service: 9.9 Excellent service is the Sandals maxim. People like Michelle more than make up for the rare person like Latoya. Great service at all of the restaurants and bars. Poolside and beach area drink service would have been nice. Reception/Front desk: 9.5 The people at the front desk were always very helpful, pleasant, and responsive. Overall: 9 Rain was a factor, but we still had a nice trip.